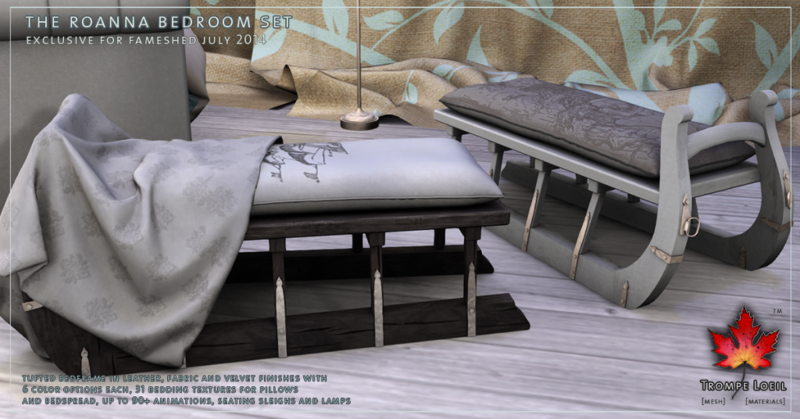 Escape the heat of summer with a cool and comfy bed that invites you to nap away the afternoon and cuddle into the night – our new Roanna Bedroom Set exclusively at FaMESHed! 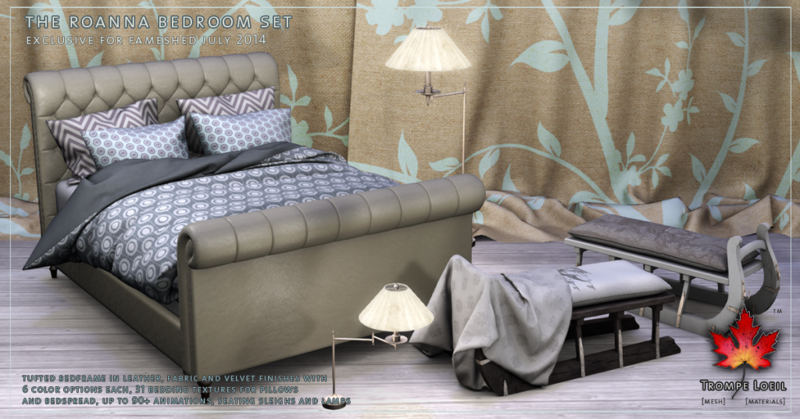 Featuring ultra-realistic blankets and pillows, tons of texture options, a special AO map addon pack for making your own customized patterns, a stylish Sleigh Seat, plus matching lighting! 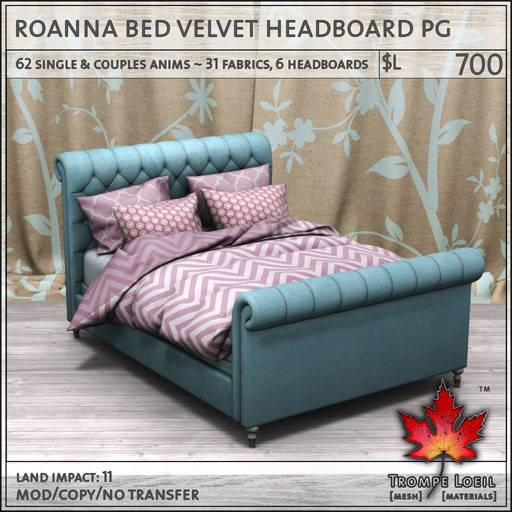 The Roanna Bed style fits with virtually any decor, from modern to classic to vintage, and is available in your choice of 3 headboard fabrics with 6 color options per set. 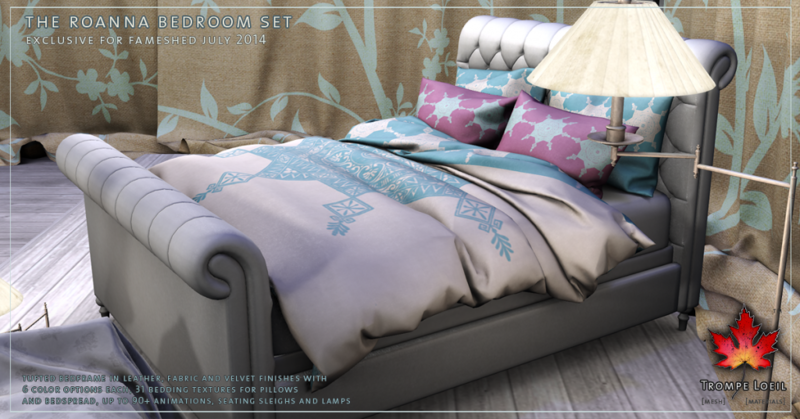 Then start browsing through the 31 mix n match fabrics for the blanket and both sets of pillows – the combinations are endless! Want more variety? Pick up the separate AO Add-on Pack that includes the three full permission AO maps for the blanket, headboard frame and pillows to make your own custom unique fabric patterns for a bed that’s exclusively you! (Requires your favorite image editing program and your imagination.) We’ve included 62 single and couples animated poses in the PG version plus an additional 29 animated poses in the Adult version for an endless array of options. Only 11 LI! Need a little extra seating? 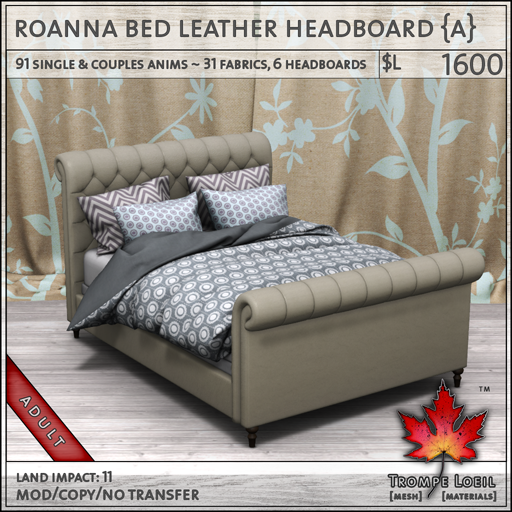 Pick up the new Roanna Sleigh Seat – you get two wood colors and two models (with and without blanket) with 6 texture options for the pillow and another 31 matching blanket texture options. 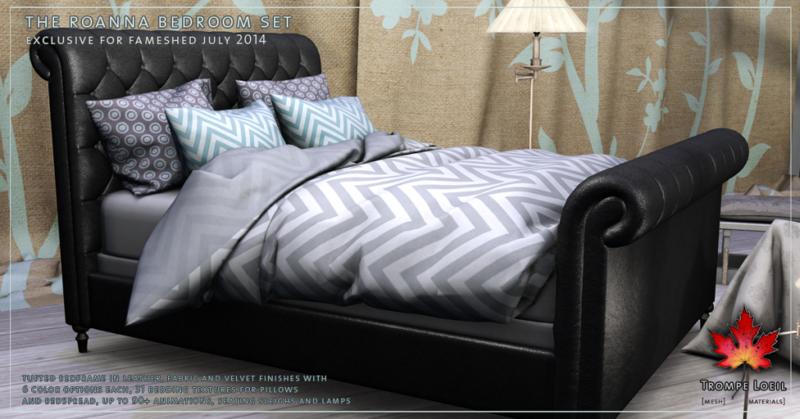 Includes 10 PG animated single poses! 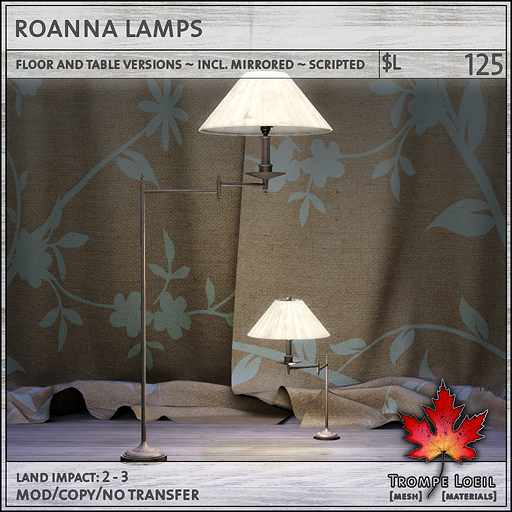 The Roanna Lamps make the perfect room finisher – includes mirrored versions of both the included floor and table top models.